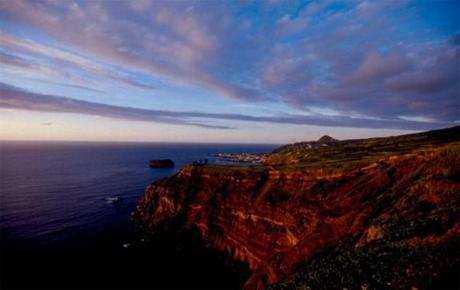 The side-by-side lakes, one green, one blue, called Sete Cidades are a must-see on the Azorean island of Sao Miguel. 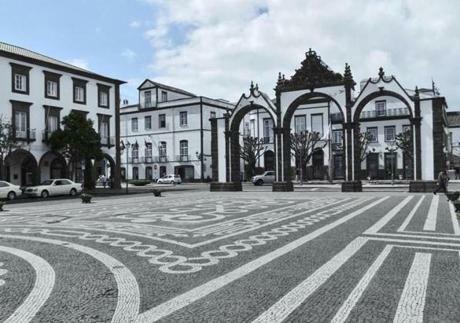 Ponta Delgada’s downtown is immaculate. 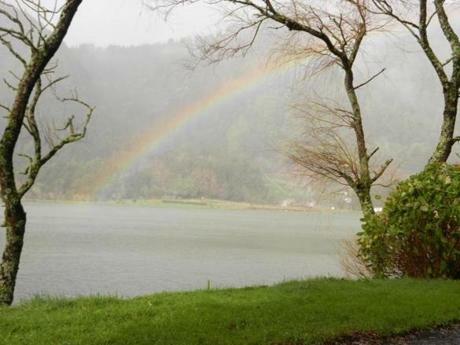 A rainbow forms over Lagoa das Furnas, a volcanic crater lake on Sao Miguel. 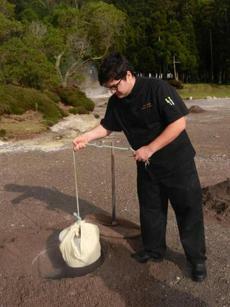 Local chef Paulo Costa lowers a wrapped pot filled with meats and vegetables into the hot earth for slow cooking. 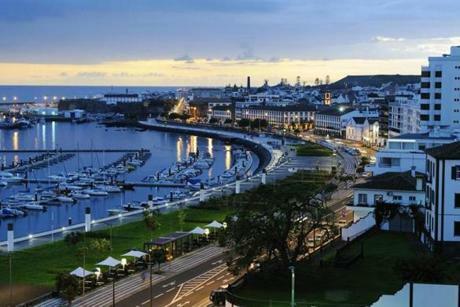 Boston is the only American city offering year-round nonstop flights to Sao Miguel, whose population of nearly 140,000 exceeds the combined total inhabitants of the eight other islands. And the flight there takes only about four hours. Tourists expecting to find the white-sand beaches of the tropics will probably be disappointed. 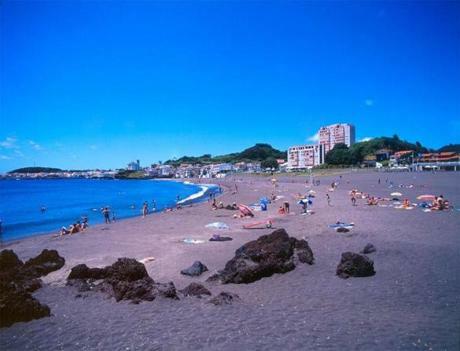 Beaches are attractive but generally rugged. Above, Milicias Beach. 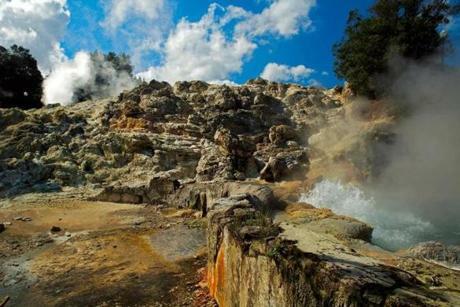 Known for its hot springs, Furnas is a verdant village that hugs a light bulb-shaped lake sitting inside the rim of a volcano that last erupted in 1630. 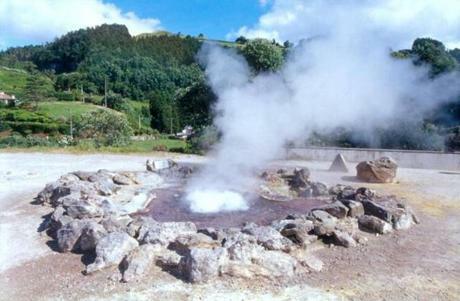 Everywhere you look there are fumaroles, those openings in the crust of the earth where steam and gases pour out. The furmaroles are unmistakable reminders that you’re standing on a volcano, and they make the center of the earth feel a whole lot closer than it really is. 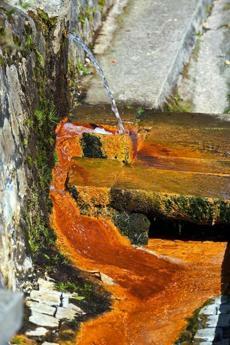 There are numerous fountains where you can sample water from various mineral springs, each one with its own distinctive taste. 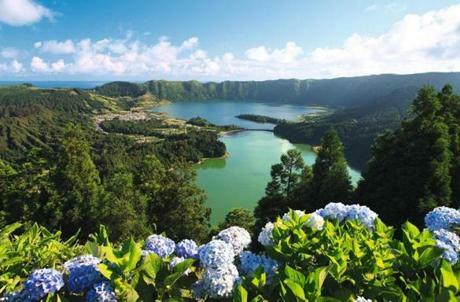 Lagoa do Fogo, or “Fire Lake,” is a gorgeous blue lake sitting in a volcanic crater rimmed by green mountains.